When you learn how to make a pea salad recipe it can be made with different types of peas; green garden peas, shelling peas, snow peas, snap peas and others. Rehydrated dried peas like the black eyed can also be used. 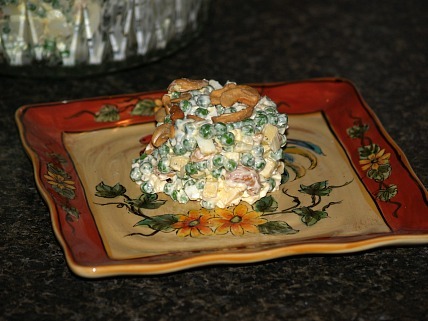 My favorite pea salads are made with the green garden peas, also called English peas. This is the type of peas which you generally purchase in cans at the grocery store. Although many people love the taste of canned peas, I prefer either freshly steamed peas or frozen peas when I am learning how to make a pea salad recipes; or anytime I fix peas. The canned peas are too mushy for my taste. I love these peas fresh from the garden. Good peas grow in smooth bright green pods which are discarded; when they are removed from the pods the peas are round and shiny green. They are very tender but even after briefly cooking they are still firm; a great quality for salads. Snow peas made a great addition to many salads; commonly found in Asian salad recipes. These peas are grown for the tender edible pod along with the tiny peas inside. They should be harvested early when the seeds (or peas) inside are still very small and the pods are still tender. When they get older the taste is not as good. Similar to the snow peas are the snap peas; also grown for its edible pod. Learn how to make a pea salad recipe with black eyed peas which is very good. Although these are called peas, they are actually beans. It was after I moved to Florida that I learned about black eyed peas. You are not a Southerner unless you learn to cook black eyed peas. They can be purchased like other dried beans. After soaking overnight in water, they cook up to be very good with a little seasoning. When these get cold they make a great addition to salad recipes. Combine in a large bowl, the peas, corn, green beans, pimentos, onion and celery. In a small bowl mix together the sugar, vinegar, oil, salt and pepper; mix well. Pour mixture over the vegetables and stir to blend. Cover and refrigerate until ready to serve. Cover beans with water, cover with lid and cook until tender. Drain beans in a strainer. Place beans in a large bowl. Add the onion, green pepper and celery. In a small bowl combine the vinegar, oil and sugar. Mix well and pour over the bean mixture. Season with salt and pepper to taste. Add a dash of tobacco and blend well. Cover and refrigerate until ready to serve. Drain peas completely; place in large bowl. Add remaining ingredients and blend well. 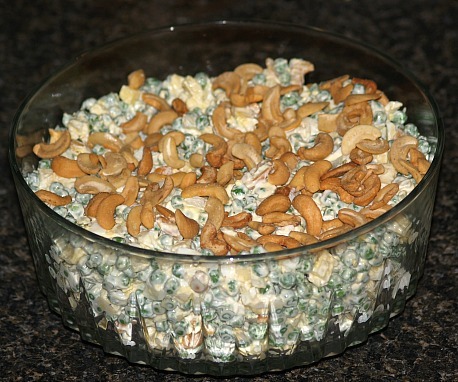 Spoon into a bowl with a cover; garnish top with cashews. Cover and refrigerate for a couple of hours. Combine and mix mayonnaise, lemon juice, soy sauce and curry to make dressing. Combine tuna, celery, peas and onions; add noodles, almonds and dressing. Combine peas, onion and cabbage in large bowl. In small bowl combine lime juice, sumac, olive oil, sugar and garlic; whisk to blend. Pour dressing over vegetables; toss lightly to coat. Season with salt and pepper; marinate 30 minutes before serving. Serves 4.